Just as Henry Flagler longed to take his railroad to Key West, bicyclists have long dreamt of riding a safe bike trail to the southern tip of the scenic Florida Keys. In fact, strong riders with street smarts and/or on guided rides bike the whole 106-mile-long Florida Keys Overseas Heritage Trail by the dozen every month, raving about the tropical scenery. But the bike trail through the Florida Keys is not finished, and many riders – me! – would not have fun on sections where you must ride on 3-foot-wide shoulders as cars whiz by at 50 miles per hour with drivers distracted by scenic beauty. If you read trip reports on Trailink, complaints about the bike trail are as common as is awe over the scenery. On a recent bicycling visit to the Keys, however, I concluded there are sections that make the Florida Keys a great place to bicycle for nearly everyone. You just have to pick your spots. And when you do, you get to enjoy one of the key reasons I love to tour by bike: You take in the scenery at a slower pace, where it’s easy to stop and enjoy. Here are recommendations for bicyclists who want to experience the Keys on their bikes but don’t want to bike the entire length or ride on narrow shoulders adjacent to traffic. I’ve assembled tips based on my experiences biking and driving the Overseas Highway, information from Florida State Parks and advice from Mark Terrill, biking guru at Key Largo Bike and Adventure Tours. The Florida Keys Overseas Heritage Trail will ultimately stretch uninterrupted for 106 miles from Key Largo to Key West. Depending on what you count, there are 80 or 90 miles of that trail completed now, with new sections opening every year. The bike trail through the Florida Keys is largely flat, but when it comes to the rider’s experience, it has some ups and downs. Some sections are more scenic than others. Some are safer and more comfortable than others. And it’s important to note that the entire trail is actually hard to follow, as it regularly crosses from bayside to oceanside and back, or continues on a parallel route not clearly marked and not visible from the U.S. 1. For those who want to bicycle the entire length, Mark Terrill’s Key Largo Bike and Adventure Tours offers one- or two-day tours and a variety of other support services. He also offers bike rentals for longer or shorter rides and tours along specific sections of the trail. He has seen use of the path grow dramatically in recent years. “There are probably 10 different tour companies, each with their own following, that run bike trips in the Florida Keys now as their winter ride,” Terrill said. Bike outfitters from Vermont, Wisconsin and Georgia, for example, organize Keys rides for cyclists from their regions. Terrill said that’s actually good for his business. “What’s helping me is that the high-end tours are so expensive, that once people find out about them, they seek out alternatives.” Many find Terrill’s company. For shorter trips, riders can easily plan do-it-yourself tours, as I did in December 2015. For 10 miles, the old state road (State Highway 4A) parallels U.S. 1 on the ocean side. It’s a scenic stretch, but has only occasional water views as it mostly passes through a woodsy residential area. The homes range from multi-million-dollar gated mansions owned by celebrities (Coach Jimmy Johnson, actor Gene Hackman) to funky oceanfront trailer courts to resorts and businesses. It’s fun to spend time seeing life in the Keys up close, including places where people live and work. At two short bridges in this section, the old road rejoins U.S. 1 and bicyclists cross the bridge in a designated lane along the shoulder. While I wouldn’t tackle the long Keys bridges riding in the shoulder (such as the Seven Mile Bridge), these bridges were easy and felt safe. We walked our bikes at the center of the bridges just to enjoy the view. It’s easy enough to find parking in this area. We started from The Islander Resort, where we were staying, but there are spaces in the nearby Islamorada commercial district at MM 81.5 . From there we pedaled south, turned around at the Tea Table Channel , then headed north and turned around at Coral Shores High School. Another good place to start your trek might be from that high school area. On our 20 mile round-trip on this section of the Keys bike trail, we also enjoyed stopping at picturesque marinas like Bud N Mary’s (MM 79.8) and historic sites, including the interesting hurricane memorial at MM 81.5. The hurricane monument tells the story of the devastating 1935 storm. In 1937, ashes of many of those who died were buried here when the monument was dedicated. Be sure to see the beautiful tile-mosaic map of the islands hit by the storm in front of the monument. There’s a charming small residential area between the hurricane monument and ocean in Islamorada and it’s worth exploring on bike to the end, where you’ll find the Moorings, the expensive resort popular for fashion shoots. It’s also where the Netflix series Bloodlines is filmed. We also shopped at the Old Road Gallery (88.8 on U.S. 1 and with an entrance also on the old road), which has gardens and an adjoining “Red Cross hurricane house” now used as an art gallery, which you can tour. Islamorada cherishes the historic extra-strong poured concrete houses built by the Red Cross to house survivors of that 1935 Labor Day hurricane. You’ll pass several marked with plaques on the ride. Around the Old Road Gallery we also admired some of the dozens of peacocks that roam this area. You’ll have an easy time finding a place to pause for a snack. Here are a few suggestions: Midway Café and Coffee Bar, MM 80.4, which earns 4.5 stars on both Yelp and TripAdvisor; Lazy Days Restaurant, MM 79.8 oceanside, has excellent fresh fish and a spectacular ocean view. Located along the way in the Morada Arts District at 200 Morada Way, just east of the old road and bike trail, is the Florida Keys Brewing Company opened in 2015. The taproom is decorated in a colorful Keys-worthy way — with mosaics made from thousands of bottle caps from breweries worldwide. It’s a lively place popular with residents. We loved the beer too! Here’s a Florida Rambler story about how Islamorada is emerging as a hub for activities. NOTE: As of July 2018, some sections of this trail are still damaged from Hurricane Irma in 2017. The bike path runs along Long Key State Park, and has some good views of the beaches and the beguiling turquoise water. Once you cross Long Key Bridge, however, the improved trail ends and is just a 3-foot-lane along the shoulder for the next two miles south. Instead of continuing, we crossed to the bayside and rode through Little Conch Key, a funky island with old cottages, mobile homes, views of the water and lots of general Keys flavor. From there, we turned around at MM 62 and headed back. This may be the best section of the FKOHT. My husband and I rode MM15 to MM5 and back in December 2016. Here’s my full report. It’s carefree. For the entire stretch, the trail has its own lane, hugging the water on the ocean side, included its own dedicated bridges. The scenery. Highlights are a half dozen bridges and long stretches with open views of water. There’s a great starting point where you can park and caffeinate– Baby’s Coffee at MM15 — and some good turn-around spots, like Key West Botanic Gardens on Stock Island in Key West. Here are the details on the bike trail into Key West. This tour will be about 14 miles roundtrip, but with the scenery and activities, you could spend all day on it. This part of the ride is open now: Pedal north along the trail for three miles through Marathon and take a right towards the ocean at Sombrero Beach Road at MM 50. You’ll be leaving the Overseas Heritage Trail but you’ll be riding on a dedicated bike path east to Sombrero Beach, which is a beautiful free local beach and well-landscaped park with picnic tables, rest rooms, swimming and snorkeling. Florida Keys Overseas Heritage Trail pavement signage. On longer rides, flat tires are common because of road debris. Serious cyclists suggest Kevlar-lined tires, fat-tire bikes or at least plenty of spares. Take special care in crossing busy U.S. 1 and in residential and commercial areas where people are turning into or coming out of driveways. This is the most hazardous aspect of the trail. Prevailing winds make a south-bound trip easier than a north-bound one. The northern-most section of the trail – from MM 106.5 to 91 — is primarily a paved bike trail separated from the highway. But as nice as the trail quality is, it’s hard to recommend because it’s not terribly scenic. 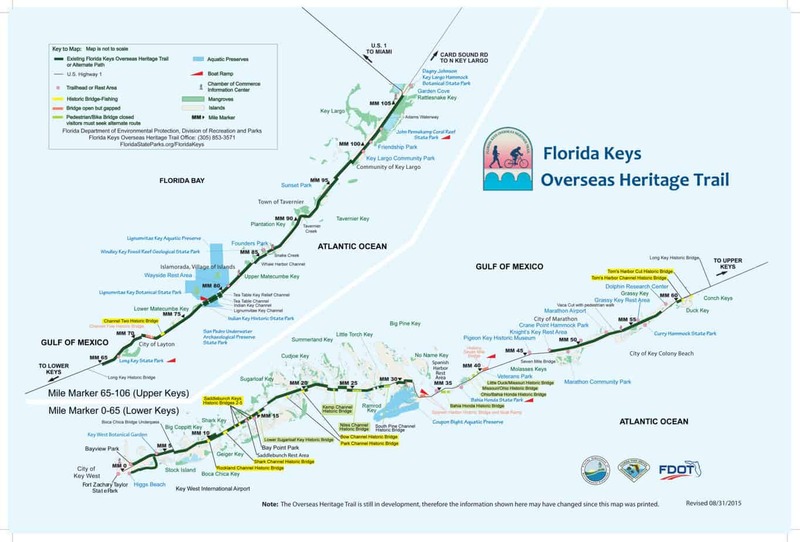 Map of Florida Keys Overseas Heritage Trail. Click for larger image. Hello. Next month I have leading a group of eight college students on a bicycling trip from Key Largo to Key West. Our bikes will be picked up in Key West. Our rental cars will be in Key Largo. Any suggestions about the best way for us all to get back to Key Largo once we’re finished biking? This must be a common predicament. Todd, I am thinking about doing this trip with HS/MS students March 2018. How was your experience? Did you camp? Bugs? Weather? Hi there! I have a question regarding gear if you have a second to respond, I’d appreciate it! I am a mountaineer and I have a 65L gregory pack that I take up. We are going on an 7 day self guided bike trip in the keys next month. What type of backpack would you recommend? I was thinking of taking this pack but I am also not an avid biker so I may be totally wrong with thinking this way. Thanks! Good luck on your trip! I’m afraid I have no expertise to answer your question. Perhaps another reader can offer advice. Thanks for visiting our site! I rode from Mile Marker 90 to Key West over three days in early February and had wonderful time. The weather was GREAT and the wind at my back. As described in the article parts of the trail are real nice, parts OK and parts just don’t exist. Maybe half of the bridges have off road trails the rest of hem are on the shoulder but I never felt uncomfortable. I did ge lift over the 7 mile bridge. Over all it was great. Just got back from the OHT and it was a blast. 226 miles, four days, 8 riders, 1 SAG. Now, some parts were a bit sketchy, but the drivers were most respectful. If you go, use kevlar tires and heavy-duty tubes. I learned the hard way. I endured two flats before a bike shop owner on Big Pine Key educated me about the proper tire scheme to use. Said he’s not had a flat in 7 years. Bring plenty of money and sample to local fare. There simply is NOTHING better than fresh fish and microbrewer beer. AND LOTS OF SUN SCREEN. The FL sun has a way of sneaking up on you this time of year as the constant breeze makes it feel cooler than it is. We had 15-20 mph headwinds all the way back from Key West! Great trip. Hi. Thank you for all your tips. Do you have any hotels to recommend? I am in a tight budget. 59 years old, female. Only 1 person. I plan on biking and visiting around.